Cloudy skies early, then partly cloudy this afternoon. High 63F. Winds S at 5 to 10 mph..
Jose Ines Espinosa grew up in Boyle Heights near East Los Angeles and at a young age developed an interest in music. He played music as a third grader at Belvedere Elementary and then the clarinet at Stevenson Middle School. 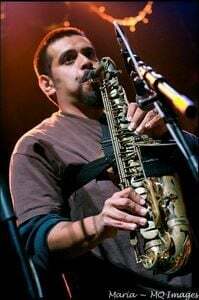 Espinosa eventually became an accomplished jazz musician and composer who served as a founding member of the Los Angeles group Ozomatli. As Espinosa, known as “Crunchy,” continued to perform and compose music on his own and with others, he was diagnosed with cancer in early 2009. He died at age 36 this past January. But Espinosa’s music and spirit live on in the form of his band, Umbalaye, which will be performing at The M Bar in Boyle Heights on Friday after two previous shows at the venue. Last December, a month before Espinosa’s death, Umbalaye performed at a fundraiser called Crunchy Fest. Music pulsed in Jose’s soul. He stretched and explored it and used the memories of growing up in the vibrant community of his youth to inspire his music. One way to describe Jose’s own musical compositions and arrangements, might be Afro Latin Funk spiced up with an Eastside vibe. Each of his musical explorations was original and bold and his stage presence could be characterized the same way. When he performed live, Jose was always improvising with his lyrics and instruments because he knew the crowd was different and he wanted to touch his audience as deeply as he could during each set. Some people believed Espinosa was raised in Cuba because of his musical style but he was a local, said Andrea Espinsoa, who had two children, nine-year-old Xiomara and four-year-old Esai, with Jose. “Best ten years of my life,” she said of their decade-long marriage. Click on the link below to read more about Espinosa in a story provided by his wife. Growing up on Third and Indiana, jumping potholes with his battered black and red BMX bike, Jose Ines Espinosa never dreamed he would one day make crowds come to their feet at some of the biggest musical venues in the world. He began playing music in the 3rd grade at Belvedere Elementary. Not until he picked up his clarinet in the music room at Stevenson Middle School and started practicing like a mad man in his best friends garage did he start to brew the dream of becoming a musician. This homegrown Boyle Heights boy would one day become a phenomenal Jazz musician and a founding member of bands such as Umbalaye, De La Esquina and Ozomatli. Jose also played with Salvador Santana, Carlos Santana, Money Mark, The Black Eyed Peas and countless other talented musicians the world over. Unfortunately, in early 2009 Jose was diagnosed with cancer. While initially the prognosis was good, after being told he was cancer free for little over a month, results came back from a routine scan and this relatively young man was told that the cancer had spread to his lungs and liver. The prognosis was not good. This did not stop Jose from playing and composing original music, in fact, it fueled his desire to write. Even though he was undergoing massive chemotherapy treatments he continued to play at least twice a week for several months regardless of his discomfort and pain. After a long hard fought battle Jose passed into the next life on January 5, 2011. Jose’s music, hope and spirit still lives on. His family and friends continue to book gigs for his band, Umbalaye, which means “Welcome to the World.” Starting at the end of June you can come and experience Jose’s music at the The m-Bar on 1st Street. Come down, be ready to dance, drink a Mbarchelada and enjoy as we continue to celebrate the music of Jose Ines Espinosa when Umbalaye, once again performs his musical creations. The band will perform Fridays June 24th, July 8th and 22nd!